Antenna Project: Sometime in July. Fox Hunts: Next event is scheduled for April 16th at 2:00PM in La Grande. Contact point will be our local repeater, 146.980 PL 100.00. There will be more fox hunts throughout the year. Summer Picnic: Has been scheduled for Labor Day, September 5th, at Joel Hinshaws house. Address is 210 Main, Summerville, Oregon. Time around 12:00 to 1:00PM. Field Day: The date is June 25-26 starting at 11:00AM. Location is Bird Track Springs Campground on Hwy 244, around 5 to 7 miles west of Interstate 84. The goal for this year is to have more participation allowing for more hours of operation on the 3 to 4 stations. Also, try to have more modes (CW, PSK31) used at specific stations. Might need more stations. We have used dipoles strung from trees historically, but this year we want to be more creative with verticals and loops in the mix. Again, more folks, more fun. Some of us will be camping before and during the contest. 7QP Contest: Date is May 7th. Great practice for Field Day. Join the GRRAA 2014 annual picnic this Saturday July 12 beginning at 12 Noon at Pioneer Park. The Club will provide hamburgers and hot dogs. Please bring your own plates, silver ware and drinks. For the pot luck portion, please bring a salad, baked beans, chips etc for 6 to 8 people. Please RSVP to Ted, president@w7gra.org or Joel, vice-president@w7gra.org so we can bring enough hamburgers and hot dogs. See you there. 2014 Fox Hunts – Grab your directional Antenna! Check in at 2:55PM on 146.550 MHz with the Hunt starting at 3:00PM. The winner chooses the restaurant and with the GRRAA covering the meal for all participants. Need more information? Talk to Graham. Mark your calendar for popular and growing swap meet. The event takes place at the Union County Fair Grounds. Check back for more information about hours, swap tables, and more. GRRAA also helps individuals acquire amateur radio education and administers amateur radio exams. If you are interested in acquiring your amateur radio license or if you wish to upgrade your existing license, please contact a club officer. A sunny weekend with temperatures in the mid 80s and light winds greeted attendees of the 2nd Annual GRRAA Swap Meet held Saturday, August 17, 2013. Amateur radio bargain hunters from around the region attended the one day event at the Union County Fairgrounds in La Grande, Oregon including a group from Vancouver, Washington. Upwards of 40 people visited the swap meet searching through six tables of old radios, meters, cables, switches, mics, training CDs, scopes, power supplies and a whole lot more. The swap meet, organized by club treasurer Mike Orcutt KF7STP with assistance by many club members, was deemed a success with an increase in vendors and about twice the foot traffic over the inaugaral event last year. In addition to many amateur radio operators attendees of another type added extra excitement during the day. Flies and yellow jackets, leftover from the Union County Fair two weeks earlier, gave hams a chance to continuosly practice their fly swatter skills. Thanks to all that attended and mark your calendar for our 3rd Annual GRRAA Swap Meet in August of 2014. 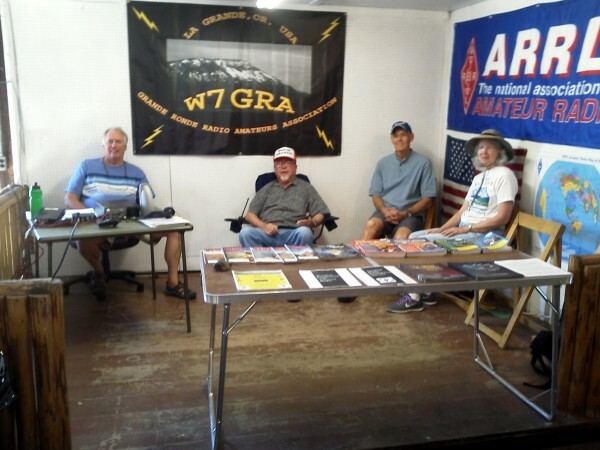 W7GRA operators Mike KF7STP, Graham W4PJS, Mark K7OWG, and Barbara KB7DRI at the 2013 Union County Fair.The GRRAA with its special event station W7GRA attracted the attention of many fair goers over the four day Union County Fair in La Grande, Oregon. The fair was held July 31 through August 3 with general attendance the last four days. This was a first time effort headed up by club secretary Mark Larson K7OWG and a host of other GRRAA club members. For a full account click here to read the club meeting report. 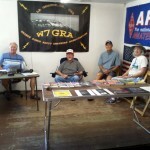 The GRRAA had a very successful 2013 Field Day operating with its club call sign W7GRA. With five club members simultaneously operating three stations the club racked up a claimed score of 780 points, a new record for the GRRAA. Operating as a Club Portable Station with power sources of generators and batteries station operators made 44 CW, 45 Digital, and 212 phone contacts. 40 meters lead the way with the most contacts followed closely by 20m followed by contacts on 15m, 80m, and one contact on 6 meters. The club qualified for ARRL Bonus categories including “100% Emergency Power, “Media Publicity”, and “Setup in a Public Place”. Join the club for Field Day 2014 next year. Contact any officer for more information. You’ll find their contact information on the Contact tab. For more information about Field Day and the official rules visit ARRL Field Day. This event shares amateur radio with the public and demonstrates the ability to communicate in an emergency.